Pastry chef and all-around good-natured guy Michel Richard let loose with some fanciful flourishes when he created this lemon meringue tart. And we’re not just talking ’bout the recipe below. He’s also responsible for the charmingly illustrated rendering above. Sorta stands to reason that a chef’s artistry not be limited to the kitchen, don’t you think? 3. Butter a 9-inch tart pan with a removable bottom. Roll the dough out between 2 large sheets of plastic wrap into a 10-inch circle. (If the dough is chilled for more than an hour, it may be tricky to roll out. If that’s the case, let it rest at room temperature for a few minutes and then try, try again.) Remove the top sheet of plastic and invert the dough into the prepared pan. Press the dough into the pan and trim the edges. Cover and refrigerate for at least 1 hour. 4. Preheat the oven to 350°F (176°C). 6. Beat the egg whites, salt, and cream of tartar with an electric mixer until soft peaks form. Beat in the sugar, 1 tablespoon at a time, and continue beating until the meringue is stiff but not dry. 7. Adjust the oven temperature to 400°F (204°C). 8. 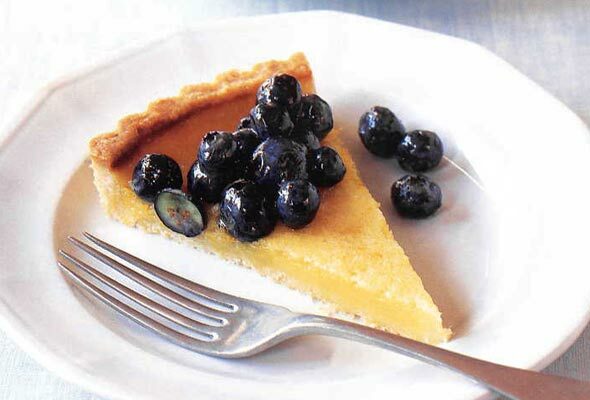 Fill the tart shell with the chilled lemon cream. Spoon the meringue on top of the lemon cream, using a spatula to completely cover the curd with the meringue, making certain to cover the edge of the tart where the cream meets the tart shell. Bake the tart until the meringue begins to brown, 8 to 10 minutes. Watch it carefully so it doesn’t scorch. Immediately remove the sides of the tart pan, cut the tart into wedges, and transfer to your best dessert plates. Serve immediately. I made this Lemon Meringue Tart for two reasons: I still have a lot of Meyer lemons on my tree, and I thought almonds in the tart dough sounded wonderful. I wasn’t disappointed. The flavors worked very well together. I made the tart and the lemon curd a day ahead, which made the assembly the next day pretty easy than. Making this tart is a bit time consuming and involves quite a few steps, but it’s not overly complicated and definitely worth the effort. I made one big tart this time, but can imagine doing little personal tarts, too. The whole process of making this tart is straightforward and the times throughout the recipe are pretty accurate. I had one minor problem with the lemon curd. Though I followed the instructions to heat it to 175°F and chilled it overnight, it was a tiny bit runny when I sliced the tart. Not much, just weeping out the tart a little after the leftover tart sat for a few minutes. I didn’t use a tart shell with a removable bottom, as I don’t have one, but it worked fine with a traditional pie plate. This is an outstanding tart. The combination of the almond crust with the lemon curd and meringue makes for a delicate and light dessert that has just the right balance of sweet and tart. It’s well worth all of the steps of creating the curd and waiting for it to cool, making the crust, blind baking it, making the meringue, and assembling the tart. Since the curd needs to be chilled for at least 6 hours, it’s probably best to make the curd a day in advance. Even the crust can be made and baked a day in advance if that fits your schedule best. The only “tweak” I’d make to the recipe is the time it takes to thicken the curd mixture; 10 minutes of stirring is much more realistic than 5 minutes. Also, as noted, the bowl should be over but not touching the water. Lemon tart. Sour, sweet, crisp, and light. Is there anything more heavenly? I think not. This tart has a lovely almond crust that brings a certain nuttiness to the dessert that’s delicious. I’d suggest that you be careful when preparing the curd and keep that bowl above the bubbling hot water. Watch the thickness; 5 minutes is about right. One other little tip: when separating the yolks from the whites for the curd, put 4 whites directly into a separate bowl, as it’s much easier than trying to divide them all afterward for the meringue. I made my curd and crust the day before and then put it all together moments before my guests arrived. My only complaint would be that a 9-inch tart is really quite small; I think doubling this recipe for a 13-inch tart would be much better. Leftovers for breakfast if you’re lucky. Besides, who could resist taking another piece after the oohs and ahhs when dessert hits the table? The taste of the tart is absolutely delicious, but no more delicious than the lemon meringue pies of my childhood, which I believe were much simpler to construct. My lemon curd took 15 minutes to reach the consistency of hollandaise. I refrigerated the tart dough overnight, and it was very hard to roll out the next day (I never did get the center thin enough though the shell was forgiving and delicious and tender anyway). If I was to make this again or wanted to use the dough recipe for another tart, I wouldn’t refrigerate it for more than an hour. I don’t think there’s any reason to do the meringue at the last minute, and I think smoothing flat is unnecessary. I had a piece of the tart for breakfast this morning (in my opinion, this is the best time to eat pies and tarts because your taste buds haven’t been sullied by a big meal); the tart was just as good as yesterday—maybe even better. Lemon Meringue Tart Recipe © 2010 . Illustration © 2010 Michel Richard. All rights reserved. All recipes and photos used with permission of the publisher. Can you suggest substitute for almonds? Allergic. Maybe cashews? Or pine nuts? Thanks! Jacqueline, that’s a swell question. We haven’t tested the recipe with a different nut, so I’m afraid that I can’t guarantee that this will work flawlessly since the oil content of nuts varies so. But I would think skinned hazelnuts would be closest to blanched almonds in terms of taste and texture. Beth, our Director of Recipe Testing, also suggested that ground macadamia nuts might be a viable substitute in this tart. Cashews and pine nuts are considerably more crumbly and tender and so I’m a little leery of trying those for fear of the crust not setting properly or being sufficiently sturdy. But I think you’d be okay with hazelnuts. Kindly let us know what you try! Ultimately good. A lot of steps and time involved. I made small tartlets and was able to finger press the dough into each one. My family does not like meringue, so substituted whipped cream. Great idea, Pamela and thanks for letting us know! Definitely making this one asap. Sounds amazing. Wanted to make this for a friend on her birthday…will the meringue survive transportation from my home to hers? or will the meringue collapse in all the waiting time?….sorry i haven’t experimented with meringue before. Farah.F, it won’t collapse. Its pretty stable. Just make sure that it’s covered–without anything touching it (I like cake carriers)–because it can be sticky.